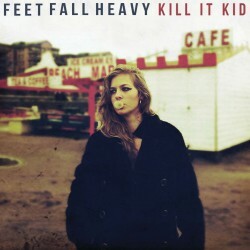 The good people at the One Little Indian label have just given me the heads up on a pretty fine new album from U.K band Kill It Kid. .'Feet Fall Heavy' is the second album from this bluesy rock outfit and will be released on September 19th next. Drawing heavily from influences as diverse as vintage American Delta blues, to modern garage rock, Kill It Kid have been marking their territory as a seriously creative force since their beginnings in Bath, England in 2008. This four piece includes Chris Turpin on Guitar and Vocals, Stephanie Ward - Piano, Vocals, Marc Jones on percussion and Dom Zozubik on Bass. Turpin and Ward each have a vocal range capable of reaching gritty heights; accompanied with unforgiving guitar riffs and trashing percussions. Violin, slide-guitar and piano are also part of the sound of Kill It Kid. 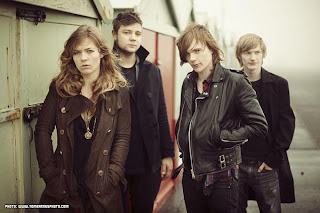 Chances are if you like The White Stripes, The Kills,or Mumford And Sons, you will love this band. Here is the official video for the first single from 'Feet Fall Heavy' called 'Pray On Me' this fine three minute rocker complete with blues sampling is a good indicator of what to expect from the album throughout. 'Feet Fall Heavy' is a scorching album that grabs you from the first listen and keeps you hooked until the last note plays out. It's the record that will define Kill It Kid as one of the steadiest new rock groups least likely to enter into mainstream territory any time soon. Stand out tracks are a plenty like 'Sweetness has A Hold On Me ' which is probably my favourite on the album. Here is a more stripped down version of that song played for the first time live in the U.K last year. 16th - Brighton,17th -Portsmouth, 19th - Britol, 20th - London, 21st - Manchester,22nd - Cardiff.